Working on a home improvement project can be a fun and productive way to spend the weekend and spruce up that Nashville townhouse. After all, we spend a lot of time in our homes, so why not show our space a little TLC and spruce it up a bit? Doing a little home improvement can also increase the value of a home, should you ever decide to use a home price calculator and put it up for sale. Whether you want to give your kitchen a refresher or work on the exterior of your home, here are a few home improvement projects you can do on a budget! Giving your walls a fresh coat of paint is a great way to bring new life to any room, and it’s a relatively inexpensive project to do! If your home has white or neutral-colored walls, consider using a more vibrant paint to give your home a fresh, new feel. 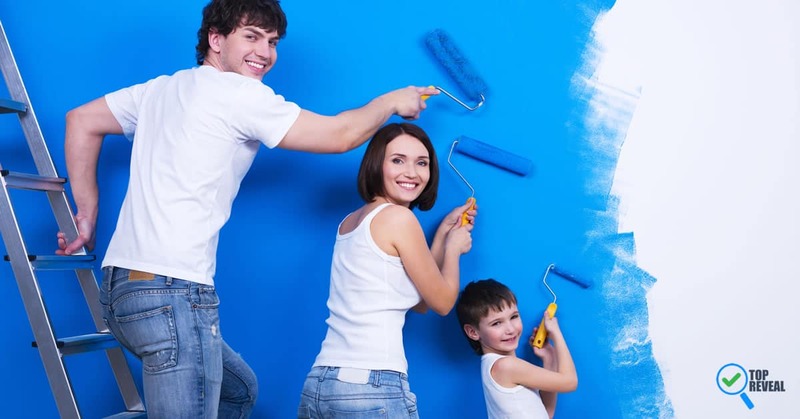 A popular trend right now is painting just one wall in a bright color to create an “accent” wall. This same look can also be achieved by using temporary wallpaper in a fun color or pattern. Your new walls are sure to earn you some compliments from guests, and you can always remove the wallpaper or paint it back to its original color if you need to. Installing something new in your home is a great way to increase its value. While this may seem like a difficult and costly task to pull off, it can actually be quite simple if you know what you’re doing. For instance, adding an overhead pot rack in your kitchen isn’t as complicated as it may sound, and it can really add value if you ever decide to sell your home. If you’re new to projects like this and aren’t sure where to start, head to your local home improvement store and talk to a sales associate about what you want to do. They will be able to point you in the direction of the tools and materials you will need, as well as give you advice and helpful tips. Whether you live in a house with plenty of land or a small apartment, planting a garden is something everyone can do with a little patience and creativity! If you do have access to an outdoor area, then start planning out how big you want your garden and what you want to plant. Depending on the time of year, there are certain fruits, vegetables and herbs that need to be planted at a certain time to ensure they will have enough time to properly grow. If you live in a house or apartment with little to no outdoor space, you can still grow many of the same things from your balcony or fire escape. Certain fruits, vegetables, and herbs, like tomatoes, lettuce, and different kinds of peppers can be grown in pots, making it easy for practically everyone to garden!